OUR PRICE: $20.32 - Join Rewards Get $2 Dance Dollars On This Item! 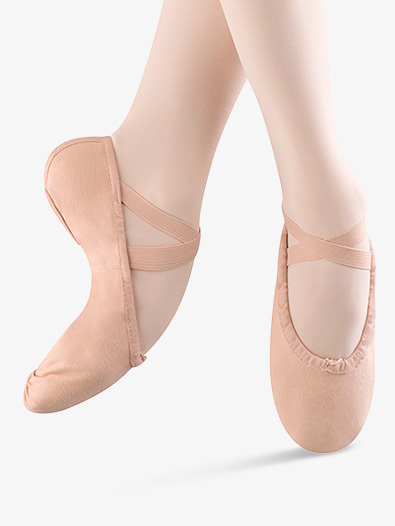 Bloch's child "Pump" split-sole canvas ballet shoe has a heel seam cushion and a breakthrough technique that reduces underfoot lumps. Criss-cross elastics attached at heel. I bought these for my 5 year old, her first pair of split sole ballet shoes, and they are perfect. She even told me "she was dancing so much better because of her new ballet shoes" during her last rehearsal. Her shoe size is between a 10-11, I bought her an 11.5 and they fit perfect. The elastic does need to be sewn but it only takes a few minutes. I ordered a pair of these shoes in size 12.5 for my 5 year old who is a size 12. I thought that I would give her a little room to grow and I wanted the shoes to be comfortable for her. When I got them, they were actually tight on her feet so I would say from my experience that they run small. I just ordered a size 13 for her instead. This is my first purchase and I wasn't too sure about the size. My daughter is size 10 bare foot and I ordered the ballet slippers size 10.5 for her. They fit very nicely. I've been using these since I started ballet 7 years ago! These are great specifically for beginners who need to get use to these split sole shoes. The only con is that I have a wide foot, and I got a wide size, then it made my foot look super bulky. But they are super comfy and are completely true to size! If you are used to these shoes you may want to start thinking about Capezio shoes, they mold to your feet better and have a nice snug fit. Overall these shoes are great and I would recommend this to specifically young dancers but any age will dance nicely in these. Hope I helped! These shoes are excellent! They are comfortable, and sturdy, so they should last a while. I highly recommend these shoes! My girls use these twice a week for an hour for class and during practice for the nutcracker. They have been wearing them since sept- jan.They have held up nicely and look great even after I washed them. The color did fade which was sad because I personally like the color they come in, but now they match with their capezio tights that I love. I just had to buy a new pair for one of my girls because her foot grew. Sewing the elastic on is tricky but if you use floss it holds up better. My girls love them and never complain. This is a great slipper, but it runs pretty small. My daughter wears a 10. So I ordered 2 pairs, one 10 1/2 and one 11. The 11 barely fit. So I would recommend at least 1 1/2-2 sizes larger than street shoe. Do these arrive with the elastic attached only on one end? I just got these in for my daughterthe elastic on both shoes is attached at the healthe other end isn't attached to anything. What the deal? The elastic is only attached at the heel. The other end must be sewn by the customer. This allows for better placement and fit on the foot. If my daughter is US size 12 do I buy a size 12.0 or is there different sizing for ballet shoes?